Subaru believes in making the world a better place, and the team at our San Antonio, TX, Subaru dealership is aligned with that goal. 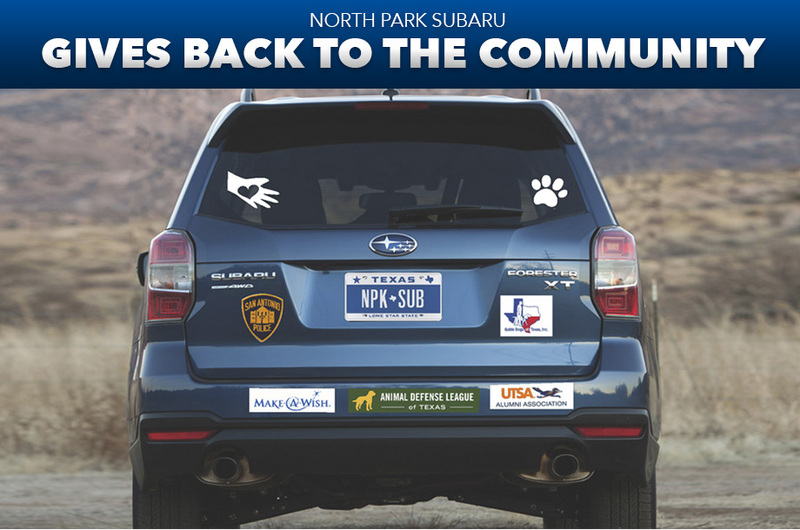 We're big believers in the Subaru Love Promise, which states our commitment to making our community a better place. We do this by partnering with a wide variety of nonprofits, charities and organizations with missions we truly believe in. After all, North Park Subaru is much more than just a business. We're a part of a community that leans on one another. We're always eager to share the love and do right by those who have supported us over the years. Take a look at some of the incredible organizations that we're so thrilled to be a part of. North Park Subaru has been a proud sponsor of SAPD's Blue Santa program for more than 15 years, which means we have the opportunity to help provide toys for children in need. With our assistance, the SAPD can help ensure children who might not otherwise have a gift to unwrap have something waiting for them during the holiday season. Make-A-Wish grants wishes to children with life-threatening medical conditions, and in the processes works to deliver hope, strength and joy. We're proud of the work we've done with Make-a-Wish -- we've even held four "Stuff the Outback" toy drives in which we pack a Subaru Outback full of gifts! We're not stopping anytime soon, either. There's always room for a few more toys in an SUV! Our children are our future, and education is an incredibly important step to building a better community for the next generation. That's why we've been pleased to partner with the UTSA Alumni Association as a sponsor for their 5K Diploma Dash for the past five years. This race helps raise money for scholarships, services and alumni programs. This year, more than 1,900 runners and 100 dogs participated, and we can't wait to see what next year has in store! At our Subaru dealership near New Braunfels, we care about our furry friends, too. Over the past three years, we've helped to raise more than $25,000 for the Animal Defense League of Texas. In addition, we've sponsored mobile pet adoption events at our stores to help bring awareness to animal-lovers within the community, and we've provided beds and bowls for their future four-legged family members. If you can't already tell how much we love animals at our Subaru dealership near Boerne, there's more! We've also partnered with Guide Dogs of Texas in the past, and look forward to working with them more in the future. This fantastic organization provides smart guide dogs to visually impaired Texans to help increase their freedom, mobility and independence. It's an incredible organization we're honored to work with.